I am working on my business again. It is 1:00 tuesday morning and I cannot sleep again because Mary is at work. I have trouble sleeping when she is not home. She works from nine thirty at night till 5:30 in the morning so she can be home during the day in case our daughter needs help with the kids. When Laura first had Kyra January 10 2000 she was single because the guy did not want any more responsibility in his life. Mary quit her job of monday thru friday so she could help Laura babysit the baby. Now she works every other weekend. She is the night supervisor at a rest home. She has cared for old people since the second year we were married. That would be 1974. The first two years we were married she delivered babies at the hospital. After Laura was born she went into rest home nursing. We have had a good life raising three kids. Some rough times like everyone has, but we prevailed and now we are both 65 years young and ready to embark on retirement. I have been retired five years. I am on social security disability from a motorcycle accident in 2002. I had my shoulder replaces several years ago. I worked as an electrician and maintenance man all my life. I took a lot of courses in night school over the years and bettered my employment over the years. I always had a hard job, with lots of heavy lifting. And my body shows the scars for it. My knees are shot from kneeling on concrete over the years. The cycle accident finished my right knee for good. The doctors want to replace it, maybe at a later date. I have had enough operations for now! Mary has back and hip trouble from all the years of lifting old people in and out of bed. They used to say hard work is good for you. Now THEY are finding out different. The golden years are not so golden. It is harder for me to get out of my lazy boy every day. When I first walk on my left leg, I have to limp till my knee stops hurting in about four or five steps. Mary's right heel is giving her nightmares with the pain. The ligaments are hurt and she has a lot of pain. We keep the pain pill people in business. I don't like to think how we will fare in the years to come. We just try to stay limber so we can get around. The times I mow the yard or remove snow are getting more painful. And for Mary, doing the jobs around the house get harder every year. We will survive somehow, because we want to stay mobile. We have had a good life, and we want to continue having it! Being with the grandkids helps delay the painful moments. And now that Tim and Sarah are married and Jeff and Heather are together, the thought of more grandchildren makes the pain more bearable. We need to stay in good health so we can spend time with all the grandkids, even the ones we do not have yet. You grandparents know what I am talking about. The times of pain are worth being with the kids. The passage of time depends whether you are feeling pain or pleasure at any given moment! If you have pain like us, you know what I mean. My favorite saying is:: Life is 10% of what happens to you; and 90% of how you respond to it! And we will respond to the pain so we can spend time with the kids even if it feels like it will kill us. This is the grandkids we spoil rotten, then send home to their parents. This picture is from two years ago. Notice the playground is big enough for future grandkids!! Am I getting my point across to you!!!! I am trying to let you know what I have painstakingly learned these 65 years I have been struggling thru my living years. I talked to Marcy the other week and she commented on how calm I am when we interact. She is dragging me into the 21 st century. I told her she should have known me before I got on my bi-polar medicine. I don't know how Mary put up with me all those years. I flashed from manic to depressive second to second. The littlest thing would set me off. I was not violent like some, but I was brooding all the time. When I diagnosed my problem and the test on the internet said I need to see a Doctor I let Mary know and she helped me get help. I changed jobs a lot, because I thought everyone was out to get me. It was not fun growing up bi-polar. I had trouble in school and almost did not finish. It took a long time till they found the right combination of medicine that made me close to normal. Whatever that might be. I was over 50 till I diagnosed myself. I am bullheaded as I said often, and I kept struggling with medicine till they found the right combination. You must keep going back and force with the Doctors to come up with something that will help you! I have argued with several Doctors over the years to help me alleviate the problems I have had. And I will again if I have to. I told you the fight we had with my daughters problems in school. She is a mother of three now, and a good provider for her kids. She fights for them to get the help they need. She learned her role in life very well. And carries it out very good. I don't let anyone push me around, and my family has learned that too. We stand up for each other! That is the way it should be. The family comes first. I hope you reading of my problems and my fights help you in your needs, makes you a better person too. Just because that person is a Doctor, does not mean they know everything. Search out what bothers you and tell someone so you can get the help you need. It will change your life like it did mine. We help each other, that is the way it should be in life. Like I am helping Bruce, we all need help sometime in our lives. I pray for everyone, not just the cherished few. I hope we do not legislate GOD out of too much in our lives. We need HIM here to help us. Like I say, we all need help sometimes! I am glad my boy has decided to be a preacher. We need more good people in the clergy. We need saved! And we are driving GOD further and further from our everyday lives. Mother's last gasp. I hope!!!! Well I looked out the window last night and everything except the asphalt and the concrete were white. Yes, Mother Nature threw one last fit. At least I hope it will be the last one! Today it is over 50 degrees and all the white stuff is melted. The big mound out front is just a small pile of snow. A last hanger on of the fierce winter we suffered thru. A reminder that Mother can be vicious if she wants to. We came thru the blast of bad weather, and now deserve spring to arrive. The winds were fierce last night too. But nothing like the weather across the other states. Mud slides, and now floods with all the rain we have now! Yes Mother is not at peace yet. I'm sure this summer she will rear her ugly head some more. But we will survive whatever she decides to throw our way. Mary got a plant delivered today. A start for the growing season. She got some weed paper to use in the garden. You spread the paper in your garden and poke holes for the plants. It keeps the weeds down. And she got some planting soil to put in the garden. To enrich the growing potential. We will soon be planting, and getting the gardens ready for the growing season. The kids will be playing outside and everything will be right with our world again. Except for Mary's older sister Shirley. It will be hard for her without her husband Donald. They liked to work together in the garden. This is the first spring without Donald, but I know she will be strong. Mary and her sisters are tough. They have to be to put up with us men. Yes the good weather will be here shortly. But I know Mother will have some surprises for us. She never lets us down, just likes to throw some curves our way! She likes to see how we handle the hurdles she throws at us. Mother gives a lot of good weather too. Sometimes we go for weeks with nothing bad happening, then bang, something happens. Just to keep us on our toes. If we have life too easy we get lazy and need the bang to wake us up. Please Mother, just do not make the bang too big! We need time between to regroup so we can fight back. Well enough of my ravings about Mother for now. Life is good and I am happy, my pains are not too bad, and my life is full of good things right now. Lord just bless everyone and help us to be in good spirits. Do not let us ban you from our lives anymore. Thank you for the good things in our lives, and keep the bad times at a minimum. Remember Today's action becomes tomorrow's habit. Make your habits all good ones! Habits are hard to break! So keep them all good! Thank you for listening to me RAVE! Yes this soon will be our back yard again. We will be in harmony with nature. you respond to it!.... Respond well, and you will live a long time! Yes I feel good again, spring is soon here, it is raining, but at least I do not have to shovel it from suicide driveway! 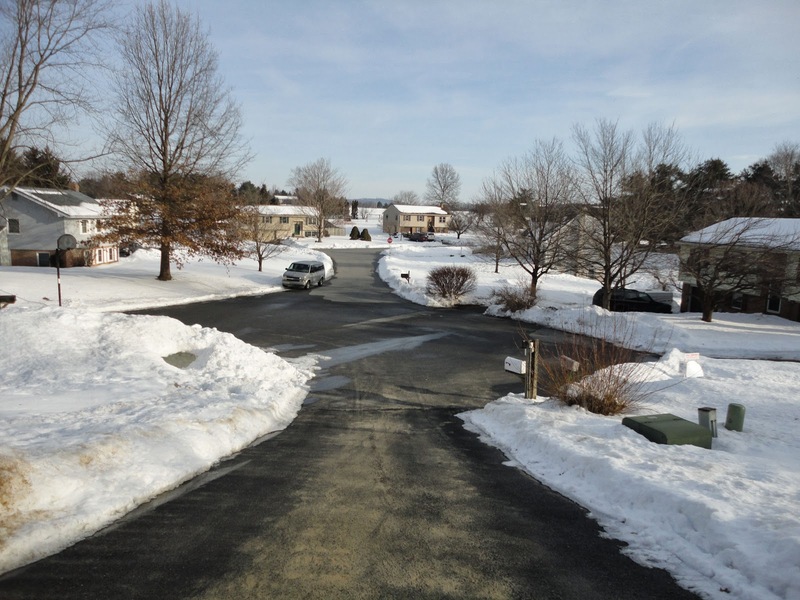 I will call Affordable Paving 717-656-4849 in Brownstown,PA next week to get the suicide driveway sealed. It is three years since they recovered it and made it look new. It was thirty years since we put it in, and it needed redone. I just hope it does not make it more slippery than it is. I don't need to fall again! If we take care of it, it should last in good shape till we give up housekeeping. With a new roof, and all new appliances I hope we are good for a lot of years. We just need our bodies to hold up as good as everything in the house. We are trying to treat our bodies good, but the years show the wear and tare. Like Mic Jaeger says, "Its a drag getting old" but it beats the alternative! The grandkids, and grand dog are here over night. The three year old just finished the chocolate ice cream for supper. Yes Mary is upstairs taking a nap, so I am in charge again. You know, spoil them rotten and take them home tomorrow night. That is our job as grandparents! My Vulcan Nomad is waiting in the garage for warm weather, Longing to take me to Paradise again! Waiting to take Jeff and Heather on the ride of their lives! Yes now that we had the money to get insurance on the motorcycle again, all is right with the universe. At least for now. Bruce will get better, and we will ride together again. Dave had breakfast again this morning with us. I will have to do like Bruce and con him into getting a bike again too. So we all three can go to breakfast with the cycles. Leave me comments about how you think I am doing in writing my thoughts down for posterity. I hope I have given you a chuckle, as we all need one. My insights into life are out of the box, but that is how I have always lived my life. I hope my fighting my problems gives you a lift and a great way to tackle the bumps in your life. If I can do it, I know you can too! Yes winter is finally over? I hope! And I can see me on the motorcycle enjoying myself. I figured what I did wrong that I could not get into my blog. Marcy told me when I talked to her on our Wednesday talk that Blogspot is part of Google and I must be logged in to Google to get in the back office of my blog. I have three Google e-mails, and I did not know I had to be logged into the one I signed up with when I started my blog. I was on the wrong one for four days, no wonder no matter how often I changed my password it did not work. I figured it out at 3:00 this morning. I just kept trying things till I got it right. 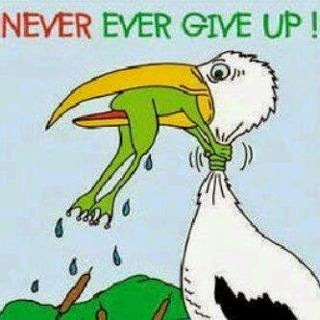 I never quit, like the frog in the pelican's mouth! Yes I never give up, I am stubborn that way. I just keep trying till I get it right! You have to be that way to be a good trouble shooter. Thats what I was my whole life. If something did now work right, I would fix it. Sometimes it would take a while till I figured out how it would work, then I could fix it. My job was to keep production running. Everyone was waiting for me to fix whatever was not working and get production running again. It felt really great when I figured the problem out and got everything running again. I instilled in my kids the same attitude. They never give up either. You have to be that way, or life runs you over. Life is 10% of what happens to you; and 90% of how you respond to it. You must not get exited and say you cannot do it. You just take small bits of the problem and figure those out, and put them all together to figure out the whole part of the problem. That is how I look at life. I know it is not how most people look at life, but then I think out of the box. What really is normal? Bruce is this way too. He is too stubborn to give up. I know he will ride his motorcycle again. He will not let the stroke stop him. He will get better, I know I would keep trying if I was in his shoes. We will ride together this summer again! I must have done something wrong and was shut out of working on my blog for four days. I was getting ravings withdrawal like crazy. I need to be on my soapbox to let off some steam. Thank you LORD for steering my hands to fix the problem. I know HE is by my side, even though I have no proof HE is there. Because I believe I know he is there. Life is 10 % what happens to you; and 90 % of how you respond to it. And since I am older, I respond a lot better to it! I don't get so mad at others, I just need to forgive myself more. I am picking up Bruce in two hours for breakfast since it is saturday and he likes to get there at 5:30 AM when they open. I am trying to get him to carry his cell phone everywhere when he goes out in case he has trouble. The stroke he had not too long ago worries me. I don't want him to relapse and not have his phone in his pocket. I carry mine now when ever I go outside. I don't want to be laying on the ground and not be able to call for help. Him likewise. I have a lot in built up emotions I need to write about. Just getting to work on this page makes me feel better. With my mindset, I need to fix any problem that is giving me trouble. When I can't figure it out, I feel like a failure. When I finally figure it out I give myself a hard time when I find out how easy it was and I spent so much energy diagnosing the problem. When I figure it out, it seems like I should have figured it out right away! I am not so hard on myself now that I am older. When I was young I really was hard on myself. I know now I can't be smart all the time. I sometimes have brain farts and it takes me longer to figure it out. Thank you for reading my new page. I feel better for writing it. I can relax now. I will not screw it up again I hope! If I do, I will figure it out in time. I never give up! I am just slower sometimes. Thank you LORD for getting us thru horrific winter. This picture is from two years ago, The grand kids having fun like they will again soon! Why do I call this my ravings? Because raving is what I do best. You need someone to listen too. And I am here for you! I know I sound condensing, it is what I do best. Look at life through my eyes and you get a chuckle. I see life differently than most other people. Whether good or bad it is my view on my living years. Everyone has their own take on life. I hope some people look at life like I do. I have a lot of people reading my pages so I must be doing something right. I hope I offer them an uplift in life. That is what I am out to do. When you can laugh at what happens to me, you feel better knowing someone else is going thru what you are. And I go thru a lot. You make my head big by all the people who are tuning in to see how my life turns next. Thank you for giving me this space to vent my aggressions. I feel better every time I write my pages. I like to talk, and this is talking to a lot of people. I tried to tell my children not to make the same mistakes I did, but I learned they had to make their own hazards in life. We cannot learn unless we go thru it ourselves. It was tough watching them learn the hard way just like I guess it was for my parents. We learn by doing. We just hope our kids learn before it is too dangerous to survive. A lot of young people don't survive their learning curve. A lot of my friends when we were young landed in the paper as. "Local youth fails to negotiate curve." Now I check the paper every day to see who I know my age died! It is a never ending battle to stay in the living years. So much can happen if you are in the wrong place at the wrong time. I pray everyday for the LORD to protect everyone I know, and those I don't know as well! I am upset the way religion is put aside in everyday life. I think we are putting ourselves in trouble by banning GOD from so much in our lives. I just hope we don't put GOD so far from our everyday lives that we forget HIM all together. We need you GOD in our lives, don't let us ban you anymore. I believe in you, show us the way to get you back in our lives before it is too late. Well enough of my soapbox again, even though it is needed. Stop back and see what I am raving about next. Leave me a comment so I know I am raving about something important again. Thank you LORD for giving me this place to unload. I need it, to feel better! THANK YOU MOTHER VERY MUCH!!! Yes it snowed most of the day. It is white on the trees and grass. Nothing but wet on roads and walks. Again the weather people were right. No accumulation where it has to be removed. Suicide driveway and the circle are just wet. I can breath a sigh again. Mary does not work tonight or tomorrow night so even if it did snow much I would not be fighting Mother after dark to open the driveway. Mary goes thursday and friday to a seminar about 40 miles away so she will be home those evenings. I hope she can sleep O.K. those evenings. Sometimes when her schedule changes she has trouble adjusting. I will be glad next year when she just works part time and has more time to garden and spend with the grandkids. She deserves to have more time for what she cares most to do. I am working on my business again. Watching daytime TV can only go so long before it gets boring. I know how Bruce feels since he can't drive yet because of his stroke. We will probably go to breakfast saturday again. I must call him later and give him a hard time for not riding motorcycle today before he calls me and does the same thing! The secret to getting ahead is getting started! I must read that every day as it is harder for me to get started doing my business. It is to tempting to sit in my lazy boy chair and watch T V. Doing nothing is the easy way out. I must keep busy so my arthritis does not hurt me so much. I have been in pain since I was about 7 or 8 years old. I did not know, I thought everybody had pain like me. I just figured others handled it better than I did. I take pain pills every day, and handle the pain as good as I can. So far it is just something I put up with. If you have arthritis you know what I mean. Everyone who has reached our age has little pains that surface a lot. Some of us have bigger pains, but keep going. We learn how to live with the aliments we are given and carry on. Life is no picnic, but the good times with loved ones tend to see us through the bad times. We are a people who carry on and do our best. We don't let bad times ruin our good times. If it had snowed a lot today we would have battled the elements and carried on. We do what we have to. We never give up. We know when to run so we can fight another day, but that is not giving up! It is being smart. Thank you for reading my look on life. I hope it gives you hope to carry on with your life. I know I look at life with a chuckle. I know we all need a good laugh to get us through the hard times. That is why I show my stupid side, we all need to learn from our mistakes so we do not repeat them too often. A learned man told me years ago when I saw a different side of a problem that he could not see. He said that is what I have you for. I can't be smart all the time! And I remember that. Sometimes the smartest people need to get a different perspective on a problem. I look at things differently than normal people! After all what really is normal? Took Bruce to the Doctor today and to see his Mother. She just turned 93 and is in good mental health. Also took Bruce to get his diabetic supplies. They ordered the wrong stuff, and Bruce was livid. I told him to not get so mad, it is hard on his heart. I need to follow that advice too. Yes it is suppose to be in the 20 degree range tomorrow and snow again. They are saying 1 to 3 inches. I can live with that, I have too. I will clear suicide driveway and neighbors driveways and the circle again. Just a little of the mound of snow in the circle is left. Mostly ice now. About three feet high. Bruce was mad about his messed up order when we got to his house and I told him cheer up. It will be warm soon, and the Doctor will clear him to drive again and we can ride the cycles together like years ago. All will be right with the world again. When life is renewed in spring that is the time to feel good again. The grandkids will be playing in the play area we have made. Kyler will get a fence in his new yard at the new house and he can run free and not get in as much trouble? You know three year old boys. Yes just make it through tomorrow's storm and we will have warm weather a few days later. Mother is just throwing one tantrum for her last storm. At least I hope this is it. If not we will survive what Mother has to offer. We are a tough lot us people in the north east coast. At least we do not have a mud slide like what happened last week. We will survive! Fill out my comments sheet and tell me how you view Mother and her trips of fancy she is throwing at us across the country. No more of this Mother, please! More of this Mother,pretty please. Kyra working in the garden again! Yes spring is on the way. Life will be renewed and all will be right in the world, at least for a short time! I believe in Santa Claus, the tooth fairy and the easter bunny, because I have helped all of them to do their jobs. I believe in doing my job to the best of my ability. I believe in a benevolent GOD and in his son Jesus Christ. Even though I have never actually seen them, I know they exist. I have felt the Lords help when I needed it. Even when I was mad at him for taking my Father from his living years. It took me a long time to understand death. Now that I am facing it more every day I am here on this earth. It gets closer every year and I am not afraid of it. Death is a part of our lives. We are born, we learn about life, get old and pass on to another plane. I will see my father again. And that makes me happy. I just am not ready to meet him quite yet! I am not thru with my living years. As I get older I believe in a lot more ideas that when I was younger. I believe GOD created more than one world, but I am not sure how many. I believe GOD'S great experiment is not his only one. I am not sure why I believe this, but I believe it, not knowing where or when his other worlds are. I believe I am on this earth to help others improve their lives. That is why when I had my electric business I gave a lot of time and money to the local youth center. We need to educate our kids so they grow up to be productive responsible adults.That is why Mary and I do so much for our kids, and their kids. Guide them to help others and be good people. Our children will do like we have shown them. We mold their minds when they are watching us as they grow up. and his new wife Sarah's wedding. About two years ago. Let me know what you think of what I believe, I welcome comments. Let me know what you believe? Oh NO Mother on the warpath again!! Yes, now the weather establishment is saying we may be in for a noreaster next week with lots of snow! I hope they are wrong again! We do not need more cold and snow, come on it is time for spring type weather to befall us. Bruce and I want to ride motorcycle. I even saw some cycles out today. Youngsters no doubt. With good circulation to keep warm. I remember yesteryear when I could ride in any weather and not mind it. Come on Mother, you gave us enough grief this year so far. Cut us a break will you. I hope next week I can tell you it was a bad forecast and nothing happened. If they are right we will survive, but we will suffer, it will be our turn! Bruce and I are going to breakfast tomorrow like we do most saturdays. We will talk about days of yesteryear when we had lots of hair, and not so much pain in all areas of our now feeble bodies. We had a lot of fun when we ran around together. Not getting in real trouble, but sowing our wild oats. Now when we sow anything it is holes in our clothes. We must behave, because our old bodies can't stand sleeping on those hard jail bunks any more. And the jailers don't give a discount for being over 62 like the eating places we patronize now. We always ask for the senior menu when we eat. You usually get free desert! Yes we are old farts, but when we reminisce we feel like we are 18 years old again, and can do anything we want, not held back by this or that pain! It is good for our soles to relive our best times, because we will never have them again. We must take pills, and see our Doctors more often than a lot of our friends. I have all my cards to remind me of visits taped on my mirror in my bathroom so I do not forget when I must go to an appointment. I even have all my Doctors numbers programed in my cell phone in case I must cancel for bad weather. Looking at this makes me long for spring and warm weather! Please Mother no more this winter! Looking at the Michigan Madman, E.J. Potter makes me feel young again as he rides his fuel injected Corvette motored and nitro fueled Bloody Mary five. The first four crashed. That's why he calls them The Widow Maker. And yes he survived all his exhibition runs and as far as I know is still alive. Just looking at this picture reminds me when I was young and foolhardy! Where is spring, I can't find it!! Yes I am ready for spring to get here! I wish the groundhog had forecast an early spring. We have had enough of cold, ice and snow. It was great having snow for the people that want to play in it. But enough already. We need the renewal of the growing season. The nice outdoors. The working in the garden, and the harvesting. Prices are going up already for everything that is grown because of the winter we just had. The kids want to play outside and us older folks want to go walking again. I want to get my paper and the mail without bundling up. We had our share of winter, let's get on to the nice weather already! Yes I am raving again, I do not need my soapbox this time. Everyone is ready for spring this year. Enough of this. Here and gone I Hope, at least for now! I'm dreaming of this MOTHER, and I know you can do it! I have faith in you MOTHER that spring is on the way. I know you will give us great warm weather soon again. You just need to tease us with cold for a while to come so we are sure that you are in charge. Thank you MOTHER for making sure we could recover from the blast of what we had this winter. God you never give us more than we can handle. And thank you for giving us the strength to survive this winter that is almost finished. Thank you for protecting us from what could have been worse. Help us all to continue in the living years. We can dream it, you can provide the ability for us to do it. I will not remove my snowblower from the tractor quite yet. Just in case!! I went over to Bruce's house, he called, he got his new cell phone in the mail. Of course we had to run back to my place to use the computer to activate it. We got the phone set up, and I showed him how to use it. We went back to his house and I programed some numbers in the phone. I told him to carry the phone whenever he leaves the house in case of emergency. That is what I do. The two times I fell on the ice on the driveway I was glad I had my phone even though I did not need it. I feel safer knowing my phone is there. Every old fart should have a cell phone handy. What did we do before cell phones? Find another way to cope! I had Bruce call his friend Dave who helped him get the jitterbug phone. Dave said thanks to me for helping Bruce set it up. I said that is what friends are for. Dave said I am a good friend to Bruce. I feel I should help all of God's creatures, and Bruce is one of God's creatures. Bruce said he will buy me breakfast for helping him with his phone. So saturday we are going to breakfast at The Udder Choice. It looks like a barn and is decorated inside with all kinds of ice cream scoops. Linda is Bruce's favorite waitress. She called Bruce in the hospital when he was in for his stroke. I don't know how she found out, but it was very nice of her. We always sit on her side, and give her a good tip. She runs around waiting on people like she has roller skates on. The place always does a good business. They are open from 5:30 in the morning till 9 at night. It is on route 322 going into Ephrata. I had Mary's van to the dealer this morning to replace a solenoid that was recalled when I ran across a guy from my teen years. I even remembered his name. I said Scott right, he said yes. I said the brain works sometimes, and he answered yes sometimes? Yes Marcy I am a lot smarter than I was a year ago, but I have a long way to go yet. I plan on learning as long as I am breathing. 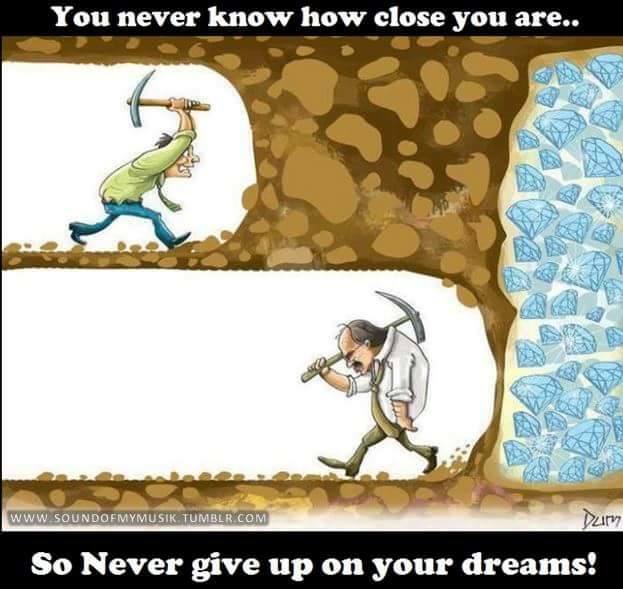 Never give up is my motto! Mother did not give us freezing rain this morning. Next tuesday it might snow again? But we will fight Mother if we need to. Spring is on the way. If I need to put the cleats on my shoes to do suicide driveway I will. Whatever we need to do we will do! We will fight to stay in the living years. I am bullheaded that way. Tell me I can't do something anymore, I will try hard to show you I still can. I am not stupid, I realize some things I can't try anymore, but what I think I can, I know I can, just slower and with caution. Now that Mary will cut back on work the end of the year and we have a chance to travel I want to stay in good shape so we can enjoy our well earned life together. We will do what we want too. When we want too. With not having to hurry back to go back to work. The golden years may not be so golden, but we will enjoy them together! Spring is on the way. The renewal of life carries on. And we will carry on too!!!! It is March 18, and the temperature is 64 degrees. Hard to believe it was below freezing yesterday and snowing. We had about two and a half inches of snow in the morning. It mostly melted before supper time. Today it is super nice, I had the sliding glass door open to the sun porch again. The cats are sunning themselves on the plant table again. Mary has more plants started under plastic to keep them moist. Spring is on the way for sure. We are suppose to expect some snow next week, maybe, but it will be warmer every day. I went to the Hess Agency to get my cycle insurance started again. Lisa filled out the forms to get the insurance started. I did not have enough money in fall to renew so I let it lapse over winter. Getting my insurance started again is a sign that spring is soon here and I will be riding cycle again. Jeff and Heather will soon be home from North Carolina and the family will be whole again. Jeff has three years of school to get his Master of Divinity, and then wherever he gets a church we will find out. 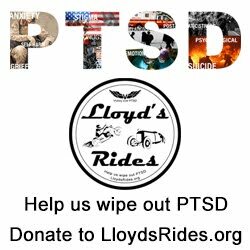 Jeff and Heather will be riding my cycle again. They both love riding cycle. It relieves stress and makes you feel free. That is why bikers like it so much! Renewed life is a spring time event. We will get the garden going again, and Mary will pick fresh plants from the garden to make for meals. The kids will play on the playground and in the playhouse. I will be mowing the yard, and Mary will be pulling weeds from the flower beds and garden. No worrying about fighting Mother on the suicide driveway. Not wearing my cleats so I don't slide and fall on the driveway. Going outside with out a coat, and sweating in the heat again. Not being cooped up in the house, unless we want to be. Having picnics outside, and taking sightseeing trips again. AH spring will soon be here. Yes I am exited, and very manic! I like the time before it gets so hot it is unbearable to be in the sun. Spring and fall is my favorite time. Riding cycle in the worst heat of summer is not my favorite either. I cannot take the heat or cold like when I was young. Old age has robbed me of that pleasure too. I will ride when I feel like it. I can ride in the mornings now. I pick my times when I do what I like. I realize I do not have a lot of time to ride anymore. Maybe 20 years yet. Although I remember a man and wife used to ride around Lancaster at 96 for the man and 92 for his wife. They had a BMW motorcycle with a side car, pulling a tent trailer. Maybe Mary and I can get a side car and pull a trailer. We will see. If GOD is good to us and we can still put our legs over a cycle at that age. I AM MORE IMPORTANT THAN YOU ARE!! I had a boss tell me that years ago. He wanted me to wear a pager so he could contact me right away and not spend time hunting me at a big plant that covered a lot of ground. He said his time was more valuable than mine. He was a retired naval aviator, and real stuck up. He treated everyone like that. He thought he owned the world and we should worship the ground he walked on. Needless to say everyone hated him and gave him a hard time. There a lot of people in this world like him. They feel they are above the laws of the land. Most of them get caught eventually and pay for their mistakes. Some get away with their games for years. I try hard to not be like that. We are not better than someone else. I try to be good to everyone and treat them the same. It is hard to do. You favor people who do for you. I did not save my post when I left this blog and lost what I had written. That is how we learn unfortunately, I will not do that again. I hope my new writing is better than the first time. My writing I lost was probably not good enough, so I must do it over! Live and learn. I was talking with a friend years later after I settled down and said I wish I had not been so crazy when I was single, and he said yeah Hoss, but you would not have such great memories. I am just glad the Lord watched over me and I am still here. All the mistakes I made over my life time are now memories and if I don't write them down they will be gone in a few years when I am. I want my followers, family to learn from my mistakes so they don't have to repeat them. But alas, they will have to make their own mistakes before they go thru their own learning cycle. I had to make my own before it sank into my feeble mind. I quess that is the same for everyone in history. We learn by doing. Unfortunately that is pain to engrave on your mind so you will remember. Some we do not impress so great, and repeat the same mistakes again! That is human frailties and we never seem to learn. Alas I am on the soapbox again, and ramble on. I wish my following family I could save them some pain, but the human mind needs stimulus to learn. We must go thru it ourselves and learn the hard truth so we remember it. History does repeat itself, we go on and fix up what we broke and carry on! We learn the hard facts of life, no matter how often. Just hoping the next lesson is not so painful as the last. I look to the Lord for guidance and the helping hand to do no wrong. I ask for His help every day. I know I need it. I am just a lowly man, and need His help often! I am taking Bruce to the Doctor in three hours, he says I am a good friend. I know he needs help, and I am available. It would be easier to just say no, but people need help just like I did a lot of times in my life. Why should I not help someone else when they need it. I will need help again before I leave these living years. It is just paying it forward so I have some credits when I need them. Besides it feels so good to help someone else instead of being selfish and saying no. There are too many selfish people in this world anyway. I want to show the world there are good people that outnumber the bad. Pay some of your goodness ahead and help others. When you meet your maker you will be glad you did. Well is my rewrite up to your satisfaction. It is different than I did it the first time. I know now it was not right before, that is why I have to do it over. In His wisdom he is guiding my hand in everything I do. YES HE IS MORE IMPORTANT THAN I AM! I just needed to write this over to know it. Thank you LORD for showing me what I knew all along. I just needed it burned into my brain! Again! MOTHER again, playing her games. No snow this week. H00ray! But Monday it might snow again. This is getting boring. I am tired of fighting suicide driveway. And I have to take Bruce to the doctor monday for his checkup from the stroke he had. I just can't wait for spring, and I am not alone. Everyone is in shock of the terrible weather we had this winter..Just get it over is the feeling. We need good weather! Half the circle is a big mountain of ice from the lousy job of plowing. I could not blow it out of the way because of the breakdown of my tractor. I lost five days of plowing till it was fixed. When I got the tractor back it had already turned into ice. Well enough of me crying the blues. We are planning what to put in the garden already. Mary has some plants started on her plant table. The grandkids are coming over tomorrow. All is right with my world. At least till Monday? If it snows, we will fight the good battle and clear it up. It is all we can do. We will survive and prosper. Mother cannot dampen our spirit. We know spring is not far away. We can see it coming and everything will be right with our world, till something comes along to throw us a curve. And we will cross that bridge when we come to it. Mary and I will handle what ever comes along next. We always have, and now is no different. This is the snow mountain taking up half of the circle at my front yard! Nature Calls, Can I answer?? Yes nature's dependent friends, the little animals are constantly calling me. I filled the bird feeders on our japanese cherry tree outside Mary's sanctuary the Florida room. And at 9:00 tonight I put water in the outside cat's dish and checked she has enough food. The neighbors cat who visits for her shelter and sometimes food lay on the table not worried I was there, But our car that lived here since she was born runs outside every time I venture to check her food. After 12 years she is still afraid of her own shadow. I feel I must help all the animals, even the squirrels need help this winter, with all the snow on the ground it is hard to get food. I like to watch the birds feeding. It makes me feel good to help God's little creatures. Right now it is not snowing and I hope it stays that way. I went to Bruce's house tonight, I could not get him on the phone, it was busy for 45 minutes, and I felt drawn to check up on him. He is recovering from a stroke about six weeks ago. And being 66 years old and gone thru a heart attack about ten years ago with no one to check up on him I felt I should. When I got about 5 miles from his house he called. He wanted to haress me about coming over on the cycle. I told him I was close and would soon be there. He thanked me for checking up on him. He was talking to a friend, thats why the line was busy. I did not want to wait and find out he was in trouble and wish I had acted. Like I said I like to check on all of God's creatures. Bruce and Dave and I are Going out to breakfast saturday. I called Tom, a mutual friend of ours to tell him about Bruce's stroke. I left him a voicemail to meet us for breakfast and surprise Bruce, because Bruce said he would like to see Tom again. I'm going to take Bruce to the Doctor on monday, he can't drive yet. I will take him to the store for groceries and to get a cell phone saturday. On monday we will come to my house so Bruce can see my blog and read about our adventures. Bruce has no computer. I hope I don't end up not being able to drive because of old age. I know if I live long enough it will happen. I will adapt what ever happens. We cannot expect to be capable to do everything in old age. I am going to put a new light bulb in Bruce's outside light on saturday. I am not so steady on a step ladder, but I will do it. Bruce needs an outside light. The only limits in your life are the ones you create in your mind. And right now I believe I have few limits when It comes to helping people. 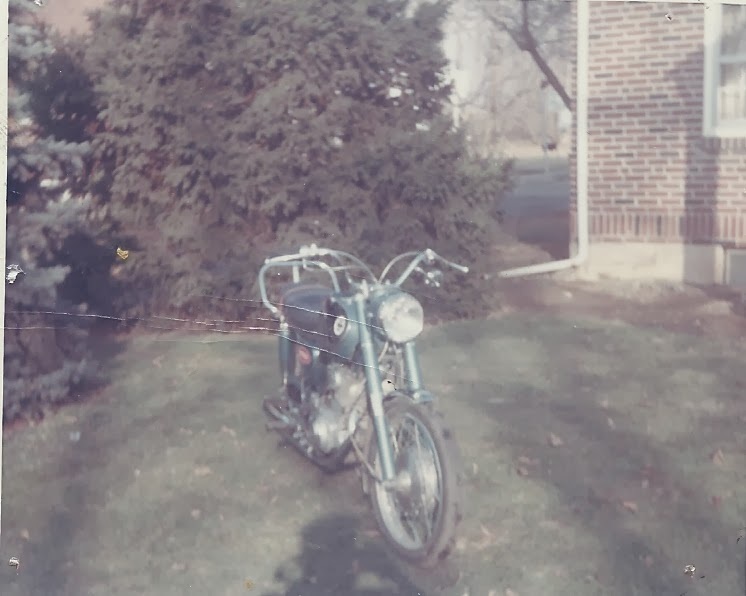 This is the bike I had when I met Bruce in 1967. I am not stupid, I will be careful with this old worn body, but I will help friends too. When I help someone it feels too good to pass up. I can do it, at least in my mind!! Well it is in the single digits, with windchill below zero. At least there is no snow or ice yet! We will see what comes tomorrow morning. The cold I can deal with, just bundle up. The last snow two weeks ago was terrible with fierce winds and snow. Trying to blow the snow out of my driveway, the wind blew it back in my face. I should have worn my cycle helmet with the bubble over my face. I put my long johns on with three sweatshirts, but I was still cold. I did not stay out as long, just did half the circle. I mind the cold now that I am an old fart. I call Bruce and harass him about riding the cycle in this weather. And he calls me and does the same. We just went to Walmart for our bi-weekly shopping trip. Everything we don't get at Walmart, Mary goes to Weis Markets to finish the grocery shopping. She works tonight and tomorrow night and has the weekend off. By the weekend it is suppose to warn up. I hope so. The grandkids come over on the weekend and like to be in the Florida room and outside. I need to clean out the garage from winter mess. And soon we need to take the snow blower off the tractor and get the belly mower on. Switch from fighting Mother Nature's snow to fighting Mothers grass and weeds. Mary already has seeds started on her plant table in the florida Room. When it warms up enough from the sun drenching in through the windows she takes her meals out there. Sometimes when she calls her friends she does it from there. I'm glad she has a place to get away and enjoy herself. I must sit on the heating pad again, my back is bothering me again. Yesterday it was Mary's turn to be hurting, her shoulder. Today she feels better, so it is my turn to be in pain. Luckily we are usually both not afflicted on the same day. Like Mic Jaeger says" Its a drag getting old" but it beats the alternative. Stop back and see how my snow watch turns out. Good for us I hope! Mary's secret hideaway, just not so secret when the grandkids are here! Or quiet! Only those who see the INVISIBLE can do the IMPOSSIBLE! Both Mary and I see the INVISIBLE! You must see what you want to do in your mind before you can make it happen. At least that is how it works for me. I must see the map in my thoughts. Only then can I make whatever I am planning happen. When I built the shed with playhouse on top at the other house I had nothing on paper. I just visualized it in my mind. When I built the playhouse here it was the same thing. It was all in my head how it would look before I started. The playhouse does not look too bad for being thirty years old. You can see the fireman pole for sliding down, and the skylights in the roof.You can also see where we sit under the porch. And the wood and coal storage space under the house. I wanted the kids to have a fun place to play like I did growing up. Alas I don't build much anymore. My body is not up to all the heavy lifting and carrying of heavy objects like when I was younger. All good things must come to an end! I am dreaming about my businesses now, and how Mary and I will enjoy our retirement. Someone else has taken over the work I used to enjoy so much. We still keep busy, but in not such a labor intensive way! We have learned a very painful lesson about not stretching our muscles like we did when we were young and nimble. We have learned to pace ourselves to fight another day. But we still see the things we want in our minds. Like the back porch Mary loves so much. She knew what to do to finish it inside and saw it in her mind and made it happen. We are so different in many ways, but knowing what we want out of life we both see clearly in our minds what we are going to get out of this life. We are a team and carve out a good life for us and our family. The longest I have owned one cycle! Before Jeff met Heather he made three trips on the cycle. Twice down to Mississippi and Louisiana. The one trip he volunteered to clean the flooding mess after the levi broke. He stayed in a hotel that had the high water mark at 29 feet. I did not know the water was that high. And one trip down to the pan handle of Florida. Jeff was taking the trips I never got to make. Mary and I started a family soon after we were married and could not take long trips on the cycle till a couple years ago when our family was grown. Jeff now takes Heather cycling when he is home. She had never ridden before and fell in love with it right away. It is something about seeing more, smelling all the roadside smells. Being free not like in a cage.Experiencing nature to the fullest. Sure there are dangers, but there is in everything we do. You can't be afraid to take a chance now and then. It is a calculated risk and you must be careful. When I sold the 650 in 2012, I had it thirty years. Jeff was riding the Nomad that he was unsure of before. Yes it is 800 pounds but it is all balance. Once you are moving it is easy to balance. My nine hundred Honda was easy to ride too. For a couple months when I bought the Nomad, I had three cycles. The garage was full. The Honda that's been in more states than I have! The year was 1966, I just graduated from high school. I had my whole life ahead of me. I got a job, and was running the loop route in town every night. My license plate on the cycle started to crack from the vibration. In later years the tail light and license holder would be rubber mounted to stop the license plate from cracking and falling off. I kept bending the plate till it broke. I knew you did not get a temporary plate till your new one arrived in the mail so I threw it in the trash so I could ride around without a plate. I went to the JP and filled out the paperwork for a new plate. It was four weeks till the plate arrived, so I put a backing plate I bought with lettering I picked up at the hardware store with Hoss on the back because I liked Dan Blocker"Hoss" on the TV show Bonanza. Most of the guys had nicknames and on the show Hoss was a mountain name for a big guy with a big heart. It fit me to a T. I also got a plate for the front of my car when I got a car in about one and a half years. I wanted people to know my name. When the replacement plate came in about four weeks I threw it in the trash and went to the JP again so I could go longer without a plate on my cycle. He did the replacement paperwork and it was six weeks this time till my new plate arrived. The cops of course stopped my the second week I had the Hoss plate on the back of my cycle so they could get my information in case someone gave my license number as Hoss. It worked, I rode ten weeks without a license plate. Everyone wanted to know how I got away so long with no plate. Then they started doing it too. I guess it happened other places too, because they passed a law that you got a temporary plate right away. But I was a rebel for all those weeks. I started another fad. It was a game between the police and us to see how much we could get away with. For a while I was the talk of the town, and helped brand my nickname to me. 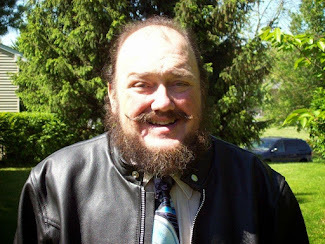 I told my wife if she does not put Hoss in my obituary most of Lancaster county will not know it was me! I worked six months at Charles Chips as electrician when I was working at the owner's house and he asked me what my real name was, because he only knew me as Hoss. I was called over the intercom at a lot of places I worked when there was a breakdown and there was a lot of Bob's or other names but there was only one Hoss. They knew I was wanted when they called Hoss over the intercom. Yes Mary never called me Hoss. Even though her nickname was Snug in nursing school. 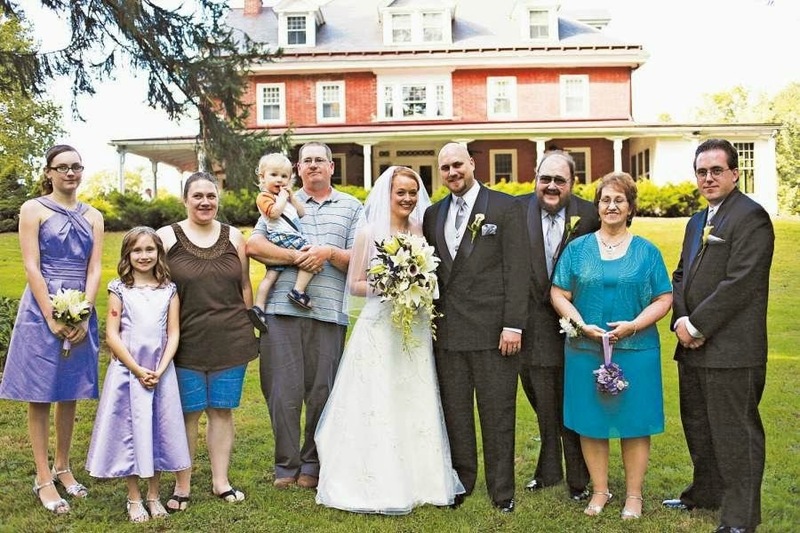 Yes Hoss and Snug paired up to raise a family. A few of my close friends call me Randy, but most know me as Hoss. I had Hoss on my business cards and had….Hoslectric….on the front of my truck for my electric business. I use Randal"Hoss" Caldwell for my buiness name now too. It will help me in searches when people look for a business. There is a lot of Randal Caldwell's out there. I need to brand my name to my business. The Caldwell clan came over from Ireland and Scotland in the early 1800's because of the potato blight and settled up and down the east coast. There is even several towns named Caldwell on the east coast. I have a charge account at the local hardware store and sign my slips Hoss Caldwell. The one lady at the cash register always says hi Hoss, sign here. Yes I have had a blessed life so far. I just hope I will be Hoss for a lot of years to go. I am not ready to give up the living years for a long time yet! I will keep fighting Mother Nature, and building my businesses. And loving and caring for my family as best I can. This is the bike I am talking about, with the Hoss license on the back. It served me well for three years. I wish I had kept it but you guys know how you tend to think of things you should have done too late. All our dreams can come true if we have the courage to pursue them! I am starting to believe my dreams will come true if I try hard enough and pursue what I have wanted for a long time. I want to have a good retirement that Mary and I can do some traveling in the 50 states of this great country we live in. See the sites that we never had the time to travel to before, just take our time and see what this wonderful land we call home has to offer. We raised our family, and now it is our turn to do what we want. The golden years might not be as golden as we have hoped, but we will enjoy them. Our aches and pains flair up, it is not so much fun growing old, but it beats the alternative. We have reached the time in our lives when we are not bound by a nine to five job anymore. A business from home gives us the freedom we have longed for. And we have talked about renting a motor home and do some traveling. Be able to stop and see the sites we could not before, because we had to be home to go back to work. We don't have to tour with the kids and not stop when we wanted to. We can take the grandkids to see the sites when we want. And we even get senior discounts. A lot of places give senior discounts, but you must ask for them, they are not advertised. We worked hard all our lives, and it is our time to enjoy life as we never could before. I never thought about being retired as I was living life to the fullest. Working hard and doing what I had to. Keeping the yard nice, and fixing up the house. Running the kids here and there. Doing what was expected of me as a father and husband. Now as a grandfather my responsibilities are different, but I still do them as best that I can. When my daughters Durango was kept overnight for inspection I took the granddaughters to the bus stop in my van because the temp was about four degrees and I did not want them to be out in that cold for long. My daughter takes them when it is cold. They walk about two blocks and must stand there and wait for the bus. I know I am a softee when it comes to kids. Yes the end of the year when Mary retires a whole new life is opening up for us. We are planning on a bigger garden, and to do the yard work more often. Keeping after weeds, and the flower beds will look nice again. Yes spring will come again, this terrible winter weather will be gone. The world will be renewed and the nice weather will be here! We will be complaining about the sweltering heat instead of the cold and snow. Instead of blowing snow, I will be complaining about mowing the grass and pulling weeds. I will be working in my businesses and keeping busy outside again. All will be good with my world again, till next winter. I will do battle with Mother Nature again, and be raving about something, what ever comes up. My big mouth will keep these pages full and I will be doing whatever I find to take up my time. Evermore! Flower beds bordering the woods. Flowers taking over the playground. MOTHER PLEASE give us a break!! Yes Mother is angry again. The weather guy says freezing rain or snow tomorrow again. And cold coming down from Canada again. It was 65 degrees today, I went for the mail with no coat on. Tomorrow with the wind chill it may be near 0 degrees. Talk about a swing in temps! I can take the freezing temps as long as It knocks the snow south of us again like last monday when we got 2 inches of snow when they said up to 12 inches forecast. Mary had one window on the porch open this afternoon it was so warm on the porch. She took her laptop out on the porch and was helping her younger sister do her taxes. Wi Fi is great, she can sent to her printer, and my desktop can do the same. Yes we are getting into twenty first century technology whether we like it or not. The only person I know of without a computer is Bruce. The driveway has a lot of sand on it yet so if we get snow or freezing rain it should blow off with little effort. Since Mary has off tonight and tomorrow night I don't need to prepare the driveway till it gets light. No fighting in the dark at 5 am. I worry about being out in the dark because if I fall no one will see me right away. I carry my phone whenever I go out, but it is still on my mind about getting hurt. Well I am going to sleep about 12 o'clock tonight I hope? I need to rest up to see how much I must fight Mother tomorrow. I hope we do not get much snow or ice, but whatever we are given we will put up with it. We cannot control Mother Nature, just repair what she hands us. ME TOO! ME TOO! Yea Right! I was never one to do what everyone else does. I have to be different. I don't dress in the latest fads, or even drive the same car as everyone else. 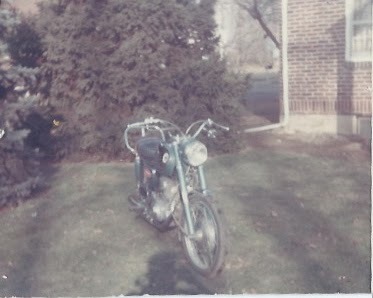 This is a picture of my second motorcycle I purchased in my senior year of high school. 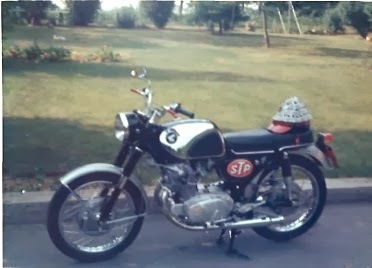 The black frame with grey fenders was the only color the super hawk came in in 1966. The second picture is my "Quarter Hawg." It was in to name your cycle then. After I had it six months and had over 10,000 miles on it I lost my license for fifteen days and stripped the frame and back fender and tank and painted it corvette blue, and installed the chromed front shortie fender. I took the Honda emblems off the gas tank and installed Maltese cross emblems in their place. That was the first year so I had the megaphones on the exhaust because they were free flowing and when enriching the carbs I got a lot more power. Also it made a lot more noise. Thats a male thing too. I got the megs because I was rear ended by another cycle and it bent the one muffler, so it was a good excuse to get better mufflers for looks and performance. When I sold the bike two years later I had over 40,000 miles on the bike. Of course we turned the odometer back 10,000 miles. Now you get arrested for doing that. 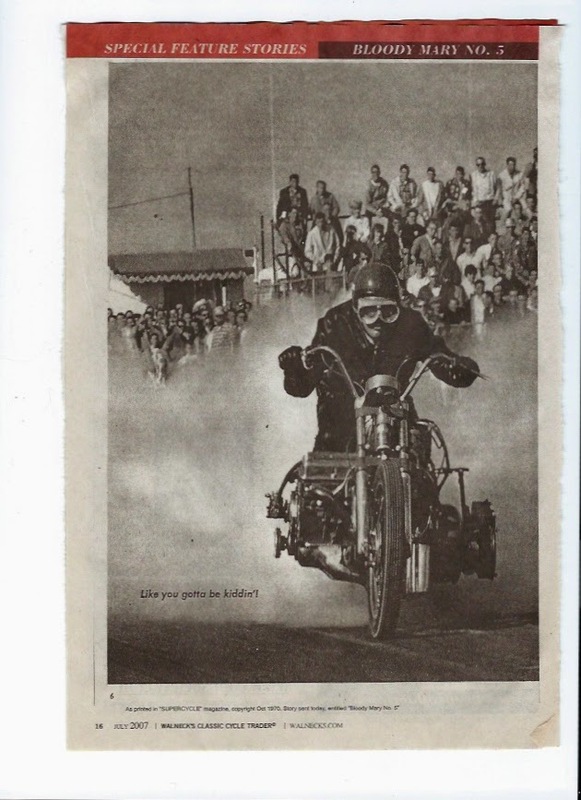 Yes they had just started inspection, but you did not need motorcycle license either back then. When you bought a bike they said the gas is here, the shift here and the brake here, and good luck. You were on your own to learn how to ride. I even customized my cars so I would be different. When anyone saw my vehicles they knew it was mine. I wore bluejeans and t-shirts before it was the in thing. I used to ride all winter in a blue jean jacket and sweat shirt. When you are young you have good circulation. I did not get a car till I was out of school a year and a half. 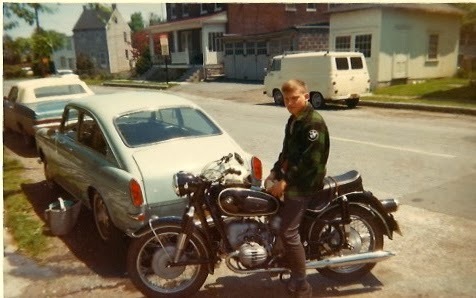 Dave laying on BMW in 1968. Dave liked to be different too. Not many guys on BMW's back then! My Corvette blue "Quarter Hawg"with blue leather seat, and chrome shorty front fender. In fall of 1966. One of the few customized bikes in Lancaster at the time. Mary got home from work about a little before six this morning, her regular time. She went to bed as usual. When she woke up about one the sun was shining and the outside temp was in the high fifties. The sun shining in the big porch windows facing the south side had the temp up to almost eighty degrees in the back porch. Mary had her wake up meal in the porch as she does whenever it is warm enough. In fact she and the grandkids ate out there last night when they stopped over for supper. I am glad we finished the porch and got larger windows. The solar heat coming in the open sliding door raised the temp in the house two degrees. Free heat! I'm glad Mary has a nice private place to eat and read the newspaper. She needs to unwind from her hectic job. Lots of times over winter when the sun is out the porch warms and we open the door and let the heat in. The cats like to lay on Mary's plant bench and soak up the sun too. It is Kyler's favorite place to play too. Not every three old has their own play room at grandma's. He did not want to go home last night. He wanted to stay and play. He fought his mom and dad to stay here. The kids spend a lot of time here. They have a good time and usually don't want to go home and back to school. That's kids, they like to be away from mom and dad to grandparents where they get away with more than they can at home. I'm glad we did not sell the house about ten years ago when Mary wanted to move to a smaller place. I did not want to leave. Mary is glad now we did not move either. We built this house with things we wanted, and spent a lot of good times with the kids here. Since we put the new heating system in, and the new windows our energy bills are a lot less expensive. And Mary loves her back porch, the gardens and the ten acres of woods behind us that cannot be developed. We are here over thirty years already, and expect a lot more. Mary says when we can no longer walk up and down the driveway, we will drive it in the car! Mary started growing some plants for the garden already on her plant bench. We got McDonalds salads Friday night and the dish with clear top is a great place to raise baby plants. The sun coming and hitting Mary's plant bench is a great place to start the growing cycle. Like my fortune cookie paper says: It is not the outside riches but the inside ones that produce happiness. It is nice to have some outside riches too, to make the inside ones possible. I'm not telling you it is going to be easy!I'm telling you it is going to be worth it! Those are the famous words of someone who was right! If it is worth it, it is worth doing it right! Not a whole lot in life is easy, but a lot in life is worth the trouble to do it. If you want a good life you must work at it. I practiced motorcycle riding when I was racing. I would go on the back roads and practice taking off at full throttle so I could launch the cycle when I was getting ready for a race. The same with the car. I would practice everything I was interested in doing well. Right now I am practicing how to build my business. Everyone must try to do what they want to be good at. I need a lot of practice at learning to use my mac computer, it is totally different from my pc. But I will keep at it till I learn enough to do what I need to do to make money from home. I am bullheaded and will keep trying till I get it. With Marcy's guidance I will master the computer. I will get it, I hope. No I know I will! Mary is going to retire in 2015, and take a big cut in salary. She plans to work part time, but I want to take up the slack so she does not have to work so much. I know I can do it, I just have to learn how to build my business up enough to replace her salary. So much Mary and I have tried has worked out good. We will give this chapter of our life the same determination we did everything else we have tackled. We will figure out this chapter of our life. Together we can beat anything we tackle together. We have done so much together that I believe we can accomplish whatever we put our minds together to do. Yes we have developed an attitude that if we can think it, we can do it. We will try to do something, and we just attack it. We will study what we need to so we can master whatever we are doing at the time, and it works out great, so far. I don't know what we will tackle next, but we will accomplish it somehow. I surprise myself sometimes in what I can figure out. And Mary sees what I cannot and leads me in the right direction. We accomplish what we set our minds to do. The human mind is a wonder. That we can imagine something, and make it happen. That is how we get so many new inventions, someone thinks of it and the mind makes it happen. IF YOU CAN THINK IT, YOU CAN DO IT! is what the mind was made for. The difficult we can do immediately; the impossible will take a little longer! Yes I am raving about winter again. When I took Mary to work tonight, she said three more weeks and winter will be a thing of the past. I hope she is right. We are all tired of cold, ice and snow. We want at least 40 to 50 degree days again. I know they will be here soon, but we cannot wait much longer. Yes we can it just seems like we can't. I want to break out my nomad and two wheel again. I get relief from all the grief of life when I am on my iron horse. The tension flows out of my body, and I feel like a kid again. I don't have to go far to feel better. It is my release. I don't need to see a shrink when I ride, all is right with my world again. You never see a motorcycle in front of a shrinks office. There is a reason for that! I know why Jeff and Heather like to ride my bike too. It brings couples together, the feeling of being one with nature, the sights, the smells the sounds and the adventure of experiencing every thing you miss in a car. When you are in a cage it is not the same as being out there. All you riders know what I am talking about. There is even a couple of services that take your casket on its last ride on a motorcycle. That is the way to go in style. Yes winter is soon over, I change the snowblower on my tractor for the belly mower. We start the garden again. Have picnics in the back yard, and the kids play on their playground again. Mary goes out daily and picks something from the garden for her salad. Just going outside in the fresh air to enjoy the sights is great. Mary picks fresh tea to drink. Renewed life is here, including the ever prosperous weeds. We have not found a way to get away from weeds yet. We don'l like to use weed killer either. We usually just rip them out. It is one more thing we have learned to put up with in life. I see life as a tradeoff of the good and the bad. You put up with some not so good things so you can have the better things in life. All life is a trade off. You just have to pick the good things you want and make them happen! Every BIG DOG was once little puppy! I get mad when I forget how to do something for my blog and must ask Marcy again, what I am doing wrong. She says everyone must learn how to do it when I get mad, it is not only myself that forgets. But I try hard to learn the first time. With my learning difficulty I must do it several times and burn it into my brain, then I am usually O.K. Till I do not do it for a while, then I can forget again so I keep notes to refresh my feeble brain bucket. She is right, no one is born knowing everything. We must learn it. I see it in my grandson Kyler, those little wheels in his brain I see turning to absorb something when he watches me do something. He is 3 years old, and he already knows how to use the computer mouse. He is like my kids, he will go far in life, just like his sisters. I must not hit on myself for making mistakes. It is part of the learning process. I am in the declining years of my learning. I have a limited amount of years left. Maybe 20 or 30 years left to progress in my doing and accomplishing something in my life. I am 65 now, and still learning. I will learn as long as I can breath. When I can no longer draw a breath, then I will let the younger race take over, I have done what I was put on this earth to accomplish. I have passed my genes on to the next group of human beings to take over the reins of life. My DNA is carried forward in my children, and their children! And I have left a story of the Caldwell line for future people to learn where we came from. If you don't put it on paper, it will die with you! Well I have put my share on these pages. My future people will know this ancestor, my thoughts and actions will be here for them to learn about their crazy ancestor. This BIG DOG will be known in the future, whether good or bad. Good I hope they take away. Write down what you want future relatives to know. I wish I had something my Dad wrote. I just have second hand stories of his exploits. And the Love he showed me when I was growing up. Thank you Dad for all you gave me! I know I am raving again, good this time. Thank you Marcy for reminding me no one is perfect, especially an old dog trying hard to learn new tricks! Thank you Mother for not dumping twelve inches of snow on us. The reason we did not get the snow is because frigid air from Canada pushed it south. But now we have below zero cold this week. At least we only got about 2 inches of new snow, but the cold is here for a while to stay. Suppose to be up to 30 degrees by the weekend. Hope they are right and the cold weather breaks. I will take Mary to work tonight so she does not have to get into a very cold van tomorrow morning. 0 or minus degree temps are not good for old bones. I know from experience! Giving her a ride home in a warm van is the least I can do for my life partner. 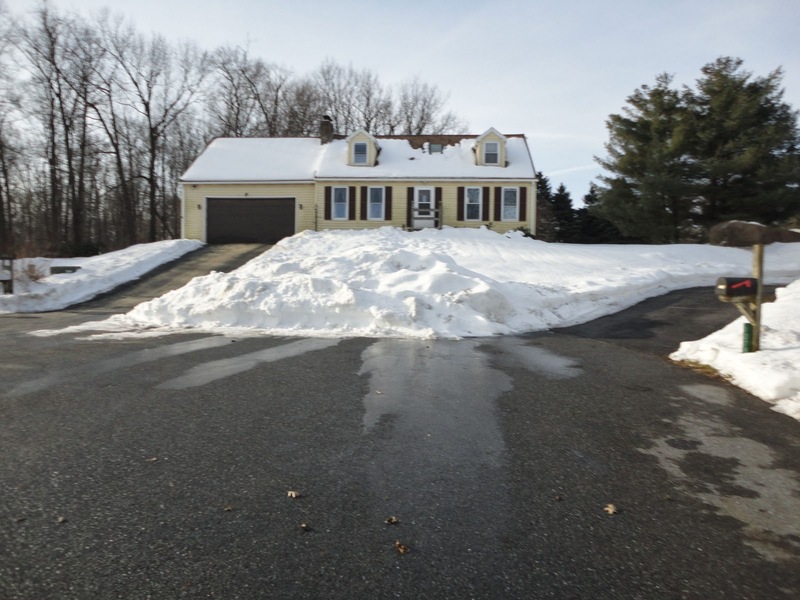 When I was working on suicide driveway I must shovel the top eight feet before I start blowing the snow because the tractor coming out the garage and starting down the hill the blower is up in the air till I leave the garage and start down in the macadam and I miss some areas. I was slipping with my cleats again, so I put sand where I shoveled to stand on. Mother you got me twice, and I do not want to fall again. Even stupid people learn from a painful episode. I called Bruce tonight and harassed him for not riding his Harley this morning. Because of the stroke he cannot work part time or drive and watching daytime TV will drive anybody crazy. I knew he needs a good laugh a couple times a week. I know how it was when I got my operations and was home-bound you go half crazy when you can't get out. Just knowing you can't go out makes it that much more that you want to go anywhere! When Bruce had his heart attack a couple years ago he was home-bound for weeks, and he survived. We all do what we have to. We complain, but we get through it. Bruce and I will go to breakfast again. He is a good friend. Mary said this summer Bruce and I must ride together again. I agree! I am learning to take better care of myself. I know I won't live forever, but I am not quite ready to give up yet. Mary and I have a lot of work to do in the gardens this summer. We need a lot of time to love the grandchildren yet. And I have to give Bruce a hard time about riding the motorcycle this summer! We have had a good life so far. I just hope we can keep the good times coming, I know we will try very hard. Tomorrrow night Mother is suppose to hit us again with twelve inches of snow, and freezing rain and ice again. Mother is really mad at us this winter! Mary does not have to work tonight or tomorrow night, This is her weekend off. But it is suppose to start Sunday night with freezing rain, and then snow all day Monday. We will put on a great battle, and we will survive. It is just a lot of extra work. I will do suicide driveway and take Mary to work as usual. The last two winters I hardly used my snowblower. This winter makes up for two easy winters. It is payback time and Mother has a big purse full of pain. I have sixty pounds of sand and about twenty pounds of ice melter on standby. The snowblower is gassed up and I will charge the battery tomorrow as usual to prepare for the battle. When I got Bruce to take him to breakfast this morning at 5:30 AM we looked at his trusty Harley in his garage on the battery charger waiting for spring. My nomad is waiting patiently for spring to. Jeff and Heather will be home in spring and give the nomad a work out again. I will too. No use griping about the weather, all we can do is fight it when it stops. I will be out in a gallant battle as usual. Help out the neighbors and clean the circle. Soon you will not be able to see my house from the street as the snow is piling up higher even though my house sits so high on the hill. Just hope the ice is not under the snow, that will be a killer combo for all of us. If that happens we will handle it. We always do. Nurses must get there to care for the old people, witch I will soon be. But my fighting days are not over yet. I am still useful in a limited way! Just not as fast. Glad Bruce got some groceries this morning. At least I don't have to worry about him starving. We will probably get some bread and milk tomorrow like everybody else. Mother do what you can. We will dig out and carry on what we have to. Mankind and womankind will do what we are meant to. We always have, and we will continue doing it till we are stopped by physical limitations. We are a stubborn people, when you tell us we can't do something, it makes us determined to prove you wrong. Thank you Lord for giving us the determination to carry on in the face of impossible odds!